ACORN // Southern Exposure Seed Exchange Needs Your Help After a Fire! Our Pals at ACORN Community in Louisa have had a SECOND fire this year, this time damaging their main building. These folks are incredible, do incredible work for agriculture and community. There are so many amazing residents, and they need some support right now. Please, if you are able to, donate to their repair fund. And definitely share this with others who might be willing and able to support them! UBS: Hands Off Appalachia! Needs Support for Arrestees! Adam Hall of Glen Daniel, West Virginia was one of 14 people arrested yesterday at actions targeting UBS, a major financier of mountaintop removal. Adam locked himself down to the entrance of UBS’ NorthAmerican headquarters while others dropped a banner and locked down inside the building. As UBS continues to fund the destruction of communities in Appalachia, it was time to bring the fight to UBS’s home in Connecticut. The 14 people arrested are being held on a total bail of $260,000. Read more about yesterday’s actionshttp://handsoffappalachia.com/ and donate to the bail fundhttp://bit.ly/Ltg4zF. LIKE and SHARE if it’s time for UBS to do what’s right and stop funding destruction in Appalachia. Richmond, Va. ~ Plans are rapidly moving forward for the fourth annual RVA Environmental Film Festival (RVA EFF), to be held around the second weekend in February, 2014. The Enrichmond Foundation, Falls of the James Group – Sierra Club, Capital Region Land Conservancy, EarthCraft Virginia and the James River Green Building Council have been working together to make sure this year’s festival is the best yet, with many insightful films designed to raise awareness of environmental issues relative to all residents of our planet – and to Richmond citizens in particular. The film selection subcommittee is pleased to announce its first confirmed film, “Lost Rivers”, a Canadian documentary that was just released this past year. Lost Rivers takes its audience on an adventure down below and across the globe, retracing the history of lost or forgotten urban rivers by plunging into archival maps and going underground with clandestine urban explorers. “Certainly this film speaks to how Richmond and other cities are rediscovering their riverfronts, but now with the proposal for a Shockoe Bottom stadium, perhaps this film will reignite interest in one of Shockoe Bottom’s lost natural features, Shockoe Creek”, said Scott Burger, a Sierra Club and RVA EFF film selection subcommittee member. The film is tentatively scheduled to be shown at the Byrd Theater on afternoon of Saturday, Feb. 8. Thanks to generous sponsors such as Bon Secours, Whole Foods Market, the Sierra Club-Falls of the James Group, REI, EarthCraft Virginia, Slow Food RVA, James River Association, Carytown Merchant’s Association, Watershed Architects, and The Fresh Market, this event is free and open to the public. This year’s Festival will feature a VIP reception to take place on Feb 7th. In addition, an environmental short film contest has been launched. More information about other films, guests and speakers, and specific schedules for each day will be made available as the event becomes nearer. For more information on the Festival, including sponsorship and volunteer opportunities, visit http://www.rvaenvironmentalfilmfestival.com. NO to a Shockoe Stadium, YES to a Historic District! 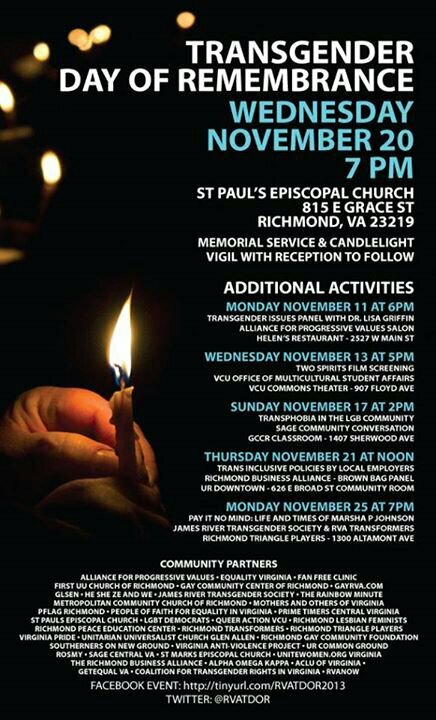 10 AM MONDAY, NOV. 11 – Gather at 17th & East Grace streets in Shockoe Bottom. Bring signs and we’ll have some for you. 6 PM – RICHMOND CITY COUNCIL MEETING. 2nd floor of City Hall, 900 E. Broad St., downtown Richmond. On Monday morning, Nov. 11, Richmond Mayor Dwight Jones will publicly call for building a for-profit baseball stadium in historic Shockoe Bottom, once the site of the second-largest slave-trading market in the United States. That evening, a resolution is expected to be introduced to Richmond City Council laying the groundwork for the stadium plan. The mayor will present his proposal as an economic development project that will create jobs and income for the City while still paying homage to the Bottom’s history. Venture Richmond, the pro-business group pushing for the stadium, is mobilizing people to attend the mayor’s announcement to try and create an illusion of community support. We need to be there to counter this. Bring your won signs and we’ll also have some for you. It doesn’t matter what bribes or incentives the mayor offers the public – not a “slavery museum” next to the stadium, a supermarket, more retail shops – it’s just wrong to play games on the site of mass human suffering. Instead, we are calling for the creation of a historic district and educational tourism destination that would finally tell the real story of how this city, state and country were built, avoid one more shameful instance of Richmond disrespecting its African-American past and bring far more economic benefits to many more people than just the small group of wealthy developers behind the stadium project.